178/365(+1), a photo by Luca Rossini on Flickr. I’ve been definitely sucked into photography. I got so deeply and fatally stuck in it that I can hardly do or watch anything else. It has always been like this, every time I get closer to serious photography, then it gets harder to return to my ordinary life, but this time I probably got too close, fact is, I returned from Alaska but I can’t seem to be able to return to my previous life. Now… I want to keep traveling, keep shooting, keep lingering and wandering around with my camera around my neck. Like the three photographers, Joseph Koudelka, Elliott Erwitt, and Mimmo Jodice did (and keep doing) in their life. They are the Authors of the books on which the Zenit-E (that is, my photography) stands. And the titles of their books tell the same story. Zingari (Koudelka) means Gipsies, which is not only the name of an ethnical group, but also a synonymous of perpetual traveling and storytelling; Scatti (Erwitt) mean shots, that is, the peculiar ability of the photographer to be always ready for a shot, wherever he is, whatever he’s doing; Perdersi a guardare (Jodice) is difficult to translate, but could be something like “getting lost in contemplating”, that is, the ability of the photographer to let himself merge with the environment, with the lens and with the camera, so that he can finally watch the scene from all the possible angles and perspectives, till finally finding the one that intimately moves him, and only then eventually moving, framing, and shooting. 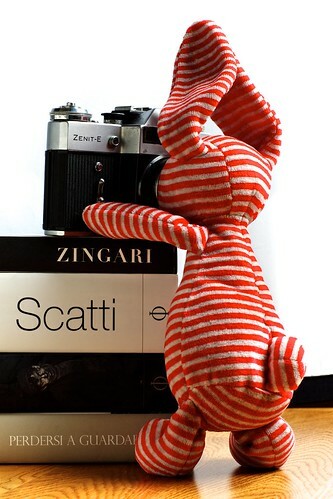 Mr Bunny had been fatally sucked into the camera, now he can’t see or do anything else than photography. I may have some more autonomy, but I’m definitely not in such a different condition.